Got confused in attempting the CSS Quiz? Here you go and change your confusion to correct way by practicing the given CSS Online test. Moreover, after reading this article, you will be perfect in attempting any CSS Multiple Choice questions. In this article, aspirants can find the CSS MCQ Online Test that makes the people improve their coding skills. Also, we heard that most of the people are facing many issues while attempting CSS MCQ. So, for such people we have made this article in an informative way, then they can show their talent over the CSS Quiz. So don’t skip away and take the below-provided test. Contenders should follow the instructions for the CSS MCQ Online Test. Candidates can have only 24 questions to answer. So candidates should be bold enough to answer any tricky questions. Everyone should manage the time and then respond. Note that there is no negative marking. And also, each question carries one mark. 2. Which of the following CSS property determines how overflowed content that is not displayed is signaled to the users? 3. Which of the following selector selects the elements that are the default among a set of similar elements? 5. Which of the following selector selects an element if it’s the only child of its parent? 6. The ______ property specifies which sides of an element other floating elements are not allowed. 7. Which of the following selector selects the elements that are currently enabled? 8. Which of the below is the correct way to set a font size? 9. Which of the following CSS property border-color property sets the color of an element’s four borders? 11. Suppose we want to arragnge five nos. of DIVs so that DIV4 is placed above DIV1. Now, which css property will we use to control the order of stack? 12. Which of the following selector matches a element based on its class attribute? 13. Which of the following Selector same as :firstline; changed under CSS3 to make pseudoelements obvious? 15. Which of the below is the correct way to set a background image? 16. If we don't want to allow a floating div to the left side of an element, which css property will we use? 17. If we want to use a nice looking green dotted border around an image, which css property will we use? 18. Which of the following is/are the valid syntax for CSS pseudo classes. 19. Which of the following properties will we use to display border around a cell without any content? 20. What should be the table width, so that the width of a table adjust to the current width of the browser window? 21. Identify the CSS property defining bottom-left corner shape of the border? 22. Which of the following is not an appropriate value for border-collapse? 23. If we want to show an Arrow as cursor, then which value we will use? 24. When we write <img src="img.png">, what "img.png" inside double quote implies? The web is ruling today. And, when we compare our past web pages, they are with full of blue links. But now, the web pages are designed with the uniques fonts, sophisticated layouts and also the customized color schemes. So, for such activity, you should learn about the CSS Language. It is thus termed as the Cascading Style Sheets (CSS). Within the concept, you can know how to implement the program and how to write the CSS rules and even the testing process. And one thing candidates should know is that this CSS is one of the critical Web Design Course for everybody specialization. 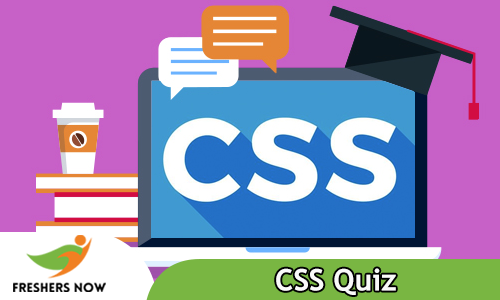 So candidates need to develop your skills more on the CSS Programming Quiz. Candidates benefited in learning how to write the CSS rules, how to test code, and how to establish good programming habits by taking the description of the questions. Within the completion of the CSS Programming Quiz, one can ensure that you can implement your sites with unique manner. Also, learn how to evaluate pages using the standardized access. Candidates can solve any sought of critical questions after practicing this test. This page guides you the easy way to solve the problems. Upon the completion of the CSS Online Test, you can evaluate your performance level. Also, after the submission of the test, you can see the Results for the test in the form of marks or grades. So, get ready for that. We not only provide you the Result for the CSS MCQ Online Test but also in turn candidates can have the better explanation for each question. So, through that explanation offered you can improve the corrections and also rectify them further. Stick on to Freshers Now for more information and develop your knowledge. Furthermore, candidates can even bookmark this page. Also, one can leave a comment for any query in the below section of the page.